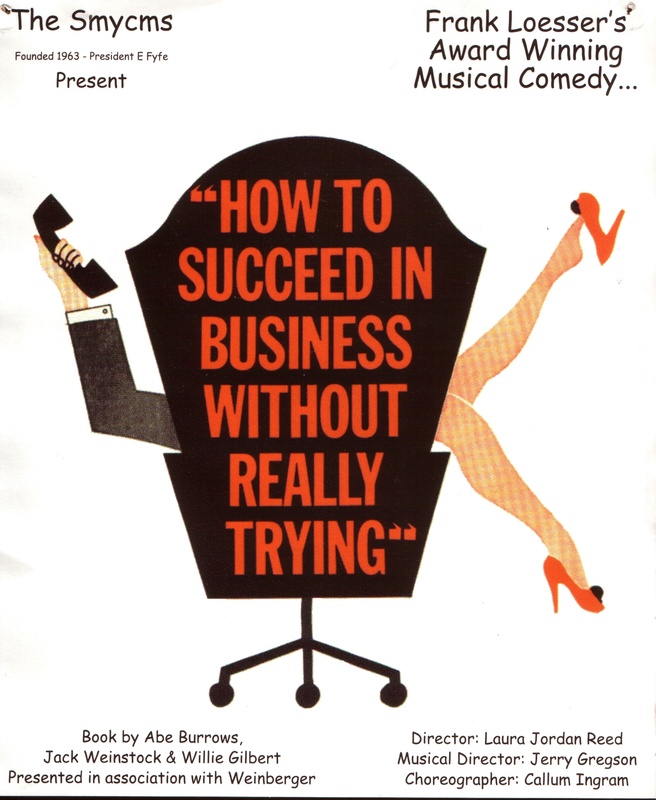 Good to see that this week at the Church Hill Theatre, Tuesday 19th until Saturday 23rd, Edinburgh Musical Theatre (EMT) are staging a wonderful musical called How To Succeed In Business Without Really Trying. Its the story of one mans rise to the top, from window cleaner to Chairman in several easy stages, helped all the way with a book from the How to series, hence the title of the show. Its full of great songs and is brim full with quirky characters, from J. Pierrepont Finch the star of the show to Bud Frump his nemesis and the delightfully named Hedy LaRue. If you haven’t seen it then get down to Morningside fast, you will not be disappointed. Whilst perusing the write up for this production in the Edinburgh Evening News 19/03/2013, I couldn’t help notice one line that read, ” EMT has a record of staging shows rarely tackled by the capital’s other amateur companies.”, well funny enough this is one show that The Smycms have staged before, back in 2001, almost 12 years ago, doesn’t time fly. Our Production of How To Succeed opened with mixed reviews, mainly down to some technical problems with the set, 2 massive 40 ft high bits of wood that refused to do what they were supposed to do, i’ll say no more. Apart from this, from a performer point of view, it was an absolute hoot to be in, it was so much fun to be a part of and i’m sure this came over in our performances. ← Get wise and Advertise.